This review has not yet been approved by the owner of this writing service. 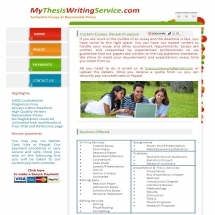 If you are the webmaster of Mythesiswritingservice.com, please Contact Us to approve or remove this review. Very limited. Colourful and somewhat amateurish-looking design covers almost complete absence of information about the service. There is a table of assignment prices, which is helpful, but not very much so – the disclaimer near this table states that it shows only rough estimations, and the real sum total may differ according to the task’s complexity and other aspects. The service offers only an approximate evaluation of how much your order is going to cost. You cannot place an order directly through the website – you have to provide its details and only then the support representative will write you back and tell you the exact price of your order. These approximate prices can be characterized as average as low, for example, essays cost from $16.49/page to $35.49/page. The price is mostly based on the degree of urgency and, to a lesser extent, on the type of text and academic level. Although the site is positioned as specialized thesis-writing service, it is not true – you can order anything from essays to math problems. For a service that seems to have the website only for appearances’ sake, the method of communication with the support team is rather poorly chosen: you can only contact them via e-mail and hope that they will answer in foreseeable future. Most often this future is foreseeable indeed: the answers come in an hour or two, but the answers themselves are as basic and incomplete as the site itself: some points are either ignored or omitted, some phrases look generic or copy/pasted, included into the reply without reading the question with any degree of attention. I had certain misgivings about ordering anything in any way important from a service, which is seemingly so uninterested in getting my order. That’s why, as a test, I placed an order on a not-very-urgent and not-very-crucial essay on economics. The result was somewhat better than I expected: the text was delivered to me well before the deadline and there wasn’t much to correct. The overall quality, however, was rather mediocre – nothing to find fault with but nothing to praise for, either. You cannot choose a writer. The service provides average, even decent quality of writing and can be recommended for less important and less urgent assignments; however, its user-unfriendly design and customer support that isn’t very eager to impart any useful information are a great downside. If you are ready to wait for answers and repeat your questions in order to pay less – by all means, use it.